This clay pipe fragment was found during excavations of an area at Balloan Park in Inverness which was shown to have late Bronze Age/Iron Age settlement. The pipe is much later, however. It has the maker’s mark stamped on the bowl: J. Davidson Inverness. 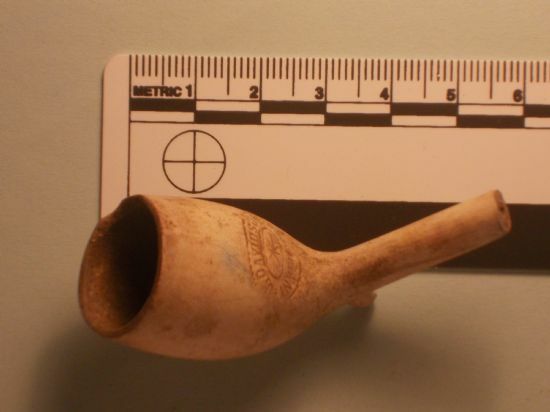 Clay pipes – or more accurately fragments of clay pipes – are frequent finds on sites throughout Britain. The practice of smoking tobacco, and using clay pipes, began in the 16th century after the introduction of tobacco from the new world. In Scotland, the pipemaking business was well established by the beginning of the 17th century, with the earliest example that of William Banks in Edinburgh in 1622 (Gallagher 2011) and the latest William Christie of Leith in 1962 (Ayto 2002). Although the general form of the pipe remained the same, styles and decoration changed over the centuries. Some later examples from the 19th and early 20th centuries have bowls with three dimensional shapes including people and animals. In Victorian times they were even used for advertising slogans. This example, however, is more typical of a pipe for general use. Such a pipe would have been affordable to most people- indeed some publicans gave away pipes with a pint of beer. Nor were they only used by men. The Inverness Burgh accounts of 1812 show that women who cleaned the Inverness Town Hall were given clay pipes (Inverness Burgh accounts, Vol. 2 (1787-1822) p. 163, available on Am Baile website). A photograph taken around 1910 in Cromarty shows a boy smoking with a clay pipe (Am Baile website: PC_CAMPBELLROSS_34). Clay pipes were also used to blow bubbles for children, manufactured for this purpose into the mid 1900s (Ayto 2002, 10). A huge number of clay pipes were manufactured. By 1650 there were at least a thousand pipe makers in London alone (Ayto 2002, 14). Their common presence on archaeological sites is not hard to understand: mass produced for all markets, the objects were easily broken and then tossed away in the midden, and then later spread onto fields. The manufacture and use of clay pipes declined in the 1900s. The presence of makers’ stamps allows us to trace movements of these common articles. Some Scottish pipes, for example, can be found all over the world, presumably carried by emigrants and travellers alike. This example is stamped 'J Davidson Inverness'. Does anyone else know of any other examples? There was a Thomas Davidson making pipes in Glasgow in Scotland 1863-1910 (Oswald 1975, 205) whose pipes are found all over the world, but I do not know whether the businesses are related. In the late 1800s/early 1900s J. Forbes & Co. was a pipe maker in Inverness (Slater’s Directory for 1911 also available on the Am Baile Website, Inverness Burgh Survey for 1899-1900, but no Davidson is mentioned. Marks may indicate pipe makers or tobacconists, and this stamp requires further research. Oswald, Adrian 1975. Clay Pipes for the Archaeologist. British Archaeological Reports 14. Gallagher, Dennis 2011. Tobacco Pipes Report (Study of the Tobacco Pipes from Biggar Archaeology Group’s Projects 1981-2010). Available on-line. Wordsworth, Jonathan 1999. ‘A later prehistoric settlement at Balloan Park, Inverness,’ Proceedings of the Society of Antiquaries of Scotland 129, 239-249.